The 1960s was an exciting decade for world cinema with the likes of Akira Kurosawa (Japan), Sergio Leone (Italy), Lindsay Anderson (England) and Jean-Luc Godard (France) making names for themselves on the international stage. Among these cinematic giants was Sweden’s Ingmar Bergman who became known for his psychologically searing explorations of the human psyche, chief among them was Persona (1966), which marked his first collaboration with actress Liv Ullmann. With its uncompromising avant garde sensibilities, Persona epitomized art house cinema in the ‘60s. It establishes these credentials right from the opening montage of surreal images that play over the film’s prologue and into the opening credits. In the middle of a performance of Elektra, actress Elisabet Vogler (Ullmann) suddenly went mute while on stage. She was subsequently tested, but was found to be mentally and physically sound. However, her muteness has persisted for three months and Nurse Alma (Andersson) has been brought in to take care of her. Initially, the young caregiver is unsure if she has the mental strength to deal with someone who has consciously decided not to speak. They meet at a rehab clinic before eventually moving to a country cottage on a remote island. This is where the real emotional fireworks begin as the two women become so close that it appears as if their identities are almost fused together. In fact, it has been argued that Elisabet and Alma are the same person. Persona is a fascinating examination of women’s psychology anchored by powerful performances from Bibi Andersson and Liv Ullmann. 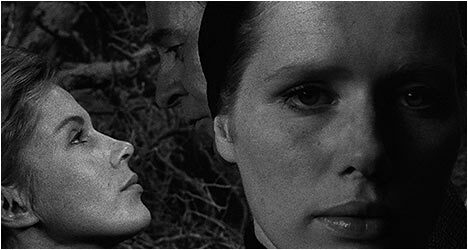 Bergman utilizes Sven Nykvist’s moody black and white cinematography as a way to get inside these women’s heads. It enhances the intimacy of their long scenes together as Alma bares her soul while Elisabet listens intently. Like many brilliant films of this kind, Persona divided critics and audiences alike, spawning passionate debates, but it continues to endure, confound and enthrall those that experience it. The moody black and white cinematography looks absolutely stunning on this new Blu-Ray transfer. The filmic grain is intact and the image’s texture looks astounding. Persona has never looked better! “Persona’s Prologue: A Poem in Images” is a 20 minute visual essay by Bergman scholar Peter Cowie that examines the first seven minutes of the film. He describes it as a microcosm of not just the film, but of Bergman’s entire career. Cowie puts the film in the context of Bergman’s career and life. Also included is a collection of interviews. There is one with Bibi Andersson, Ingmar Bergman and Liv Ullmann that was done in 1966 for Swedish television. The director talks about audience expectations while the actresses talk about their challenging roles. There is an interview with Bergman from Canadian T.V. in 1970 where he talks about the origins of Persona. Ullman is interviewed in 2013 and recalls what it was like to make the film and working with Bergman. She also examines her approach to the character of Elisabet. Finally, filmmaker Paul Schrader talks about Persona’s legacy and puts it into the context of European cinema in the ‘60s. Also included is 18 minutes of silent black and white footage shot during the production of Persona with audio commentary by Bergman scholar Birgitta Steene, which takes us through the making of the film. “Liv & Ingmar” is a 2012 feature-length documentary about the five-decade friendship and working relationship between Bergman and Ullmann told from the actress’ point-of-view. It is a touching love letter to the man and his films as Ullmann offers her initial impressions of the man and recalls moving anecdotes about working with him.